"I have known Lou Mayes for approximately 15 years. During that time as Fire Marshal, I have personally worked side by side with Mr. Mayes inspecting his work many times. His work has always been neat and orderly and more importantly BEYOND what the code requires. Lou has always worked well with our inspectors in the area." Why have customers been coming to us for over 37 years? Because they can count on us. We work hard for our customers, building a reputation for integrity and quality since 1973. Times and technology have changed, but our focus on honest service hasn’t. That’s why repeat customers make up a substantial part of our business. 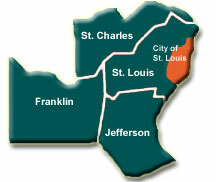 As word of Mayes Electric’s quality and dependability spread, the range of our operations has expanded throughout the St. Louis suburban area including St. Charles, Franklin, and Jefferson Counties. Customers know the job will be completed professionally, on time, and on budget; that's why they always come back. Our founding values of pride and integrity have brought success for the past 37 years. We will continue to provide these values and level of professionalism. Price, safety, up to code, professionalism, reliability, and punctuality are what we provide on every job. © 2008 - 2010 MayesElectric.com. All Rights Reserved.